On Friday we twalked again – that is we walked, talked and tweeted (#twalk). Unlike our hot, sunny walk in May, it rained a lot! 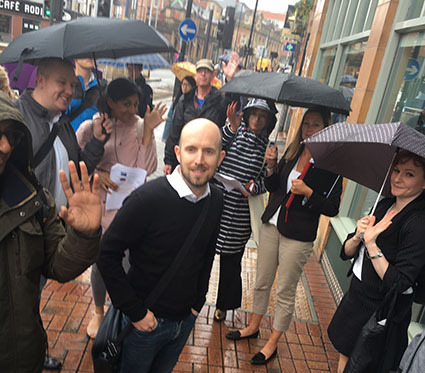 As mentioned in the previous post, Friday’s twalk was part of ALT’s Learning Spaces Special Interest Group meeting which was co-hosted in The Diamond by the University of Sheffield and in Sheffield Hallam University’s Institutes of Art renovated ‘General Post Office’, the Sheffield Institute of Education’s Charles Street Building, and our STEM annex. The theme of the twalk was Crossing Boundaries – a very flexible, and I think, pertinent topic. In this post, I want to reflect on the relationships of walking, thinking, topic and place. Walking is not sitting. It is a lively and stimulating act that better reflects the human condition and it demonstrates how one of the main purposes of the conceived campus is to control people by enclosing them in rooms that can be managed (that is not to suggest that management and control are bad things; indeed, they are a necessary dimension of the teacher’s role which I will explore later). Creating space for thinking (and learning how to create thinking space for yourself) is essential for learning. Thinking space is sometimes provided (designed into teaching with care), but is often a highly personal matter. I have run many workshops where I ask participants “where do you learn?” and the responses are diverse and personal. Anything from “the train” to “the bath”, and occasionally places on campus that just work. The role of learning topic is interesting for me and we develop this in a minute. However, it begs the question, to what extent should the physical environment relate to the subject of study? I define place here as the situation created by the participants. Place, on a walk, is viable and contrasts with space as something that is passed through. The place is psychosocial, physical and digital, being unique in time reflecting a co-constructed situation and the ecologies of the participants. engaging with publics through exhibitions and open access spaces. co-constructed – the spatial meaning comes from the moment. The learning group addresses a problem as they walk and the physical nature of the space is not as important as what it makes (from memory through to specific plan). One of the outcomes of the #twalk concept is the digital connectivity that makes clear that the value of the learning and the walking is the talking. The incorporation of the tweetchat makes clear that this idea of co-constructed psychosocial place is most important. Areas that require further exploration in relation to this topic include nomadicism and the guiding role of the teacher. The teacher’s role to control and manage the learner and the learning environment warrants further exploration in relation to learning walks. The Peripatetic School was a school of philosophy in Ancient Greece dating from around 335 BC when Aristotle began teaching in the Lyceum. (see Wikipedia article). Peripatetic means ‘of walking’ and alludes to Aristotle’s habit of lecturing and walking through the colonnades of the Lyceum. This entry was posted in active learning, learning space, walking and tagged boundaries, CPD, engagement, in-between, learner engagement, liminality, place, placemaking, situated learning, Third Space, twalk, tweetchat, walk. Bookmark the permalink.